Elmira Mennonite Church in Elmira, Ontario, Canada was organized on 31 August 1924, and occupied its first building the same year. Oliver D. Snider is considered the founding leader of the group and served as pastor for the first 12 years. Abraham Gingrich served as bishop during the first years of the congregation's existence. The congregation originated through church planting from the Floradale Mennonite Church. The original structure was built in 1924. In 1955, an educational wing was added, and in 1976 an entrance with ramps, new washrooms, and a new kitchen, as well as library and classroom space were added. Additional alterations were carried out in 1992, 2009, and 2011. Elmira is a parent church to Bethel Mennonite at Elora (1947), Hawkesville Mennonite (1950) and Zion Mennonite Fellowship (Elmira) (1987). Bechtel, Ken. Three Score Years: Elmira Mennonite Church, 1924-1984. Elmira, 1984, 67 p.
Brubacher, Jim. "An Examination of a Recent Schism in the Elmira Congregation." ca. 1970, 6 pp. Martin, Willard. "History of the Elmira Mennonite Church." 1959, 12 pp. Mennonite Reporter (16 September 1974): 4. Congregational archives at Mennonite Archives of Ontario. Bauman, Howard S. and Sam Steiner. "Elmira Mennonite Church (Elmira, Ontario, Canada)." Global Anabaptist Mennonite Encyclopedia Online. July 2000. Web. 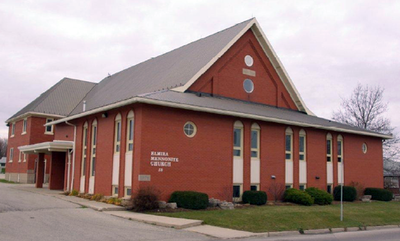 21 Apr 2019. http://gameo.org/index.php?title=Elmira_Mennonite_Church_(Elmira,_Ontario,_Canada)&oldid=142264. Bauman, Howard S. and Sam Steiner. (July 2000). Elmira Mennonite Church (Elmira, Ontario, Canada). Global Anabaptist Mennonite Encyclopedia Online. Retrieved 21 April 2019, from http://gameo.org/index.php?title=Elmira_Mennonite_Church_(Elmira,_Ontario,_Canada)&oldid=142264. Adapted by permission of Herald Press, Harrisonburg, Virginia, from Mennonite Encyclopedia, Vol. 2, p. 190. All rights reserved. This page was last modified on 1 January 2017, at 22:05.